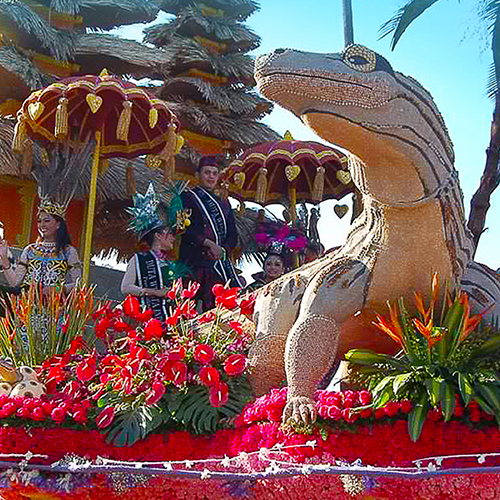 For over 30 years, AES has been a premiere float builder for the Rose Parade, creating show-stopping, award-winners that attract local and national media coverage and spark conversations that last long after the parade is complete. In the past few years alone, our company has created floats celebrating Nintendo's Pac-Man character, George Lucas’ Star Wars, and NBC’s The Voice, and we were honored to receive the prestigious “Extraordinaire Trophy” for our 2016 Disneyland Diamond Celebration entry. At AES, we pride ourselves on delivering an exceptional float sponsor experience. With our year-round team of more than 200 creatives and fabricators, we provide our clients with industry-leading craftsmanship and one-on-one support throughout the lifecycle of their project, from design through construction, logistics, and event-planning. Ag Phd - Wrigley Legacy Award for most outstanding display of floral presentation, float design and entertainment. China Airlines 2018, Winner of the"International Trophy for the Most Beautiful Entry Outside of the U.S"
Netflix - Winner of the "Craftsman Trophy" for Exceptional Achievement in Showmanship. the "Crown City Innovation Trophy" for Best Use of Imagination and Innovation. China Airlines 2017, Winner of the "International Trophy for the Most Beautiful Entry Outside of the U.S "
China Airlines, Winner of the "International Trophy"
City of Huntington Beach, Winner of the "Mayor's Trophy for Outstanding City Entry"
Quikrete Co., Winner of the "Bob Hope Humor Trophy for Most Comical and Amusing"
the "Theme Trophy for Best Presentation of the Rose Parade Theme"
Namco's Pac Man, Winner of the "Judges' Special Trophy for Outstanding Showmanship"
China Airlines, Winner of the"International Trophy for the Most Beautiful Entry Outside of the U.S"
Indonesian Airlines, Winner of the "Directors Trophy"